The opportunity of being in on the ground floor on policy formulation is a strong reason for him joining the Palmer United Party (PUP), says youth activist and businessman Matty Day. “We need good, strong policies for young people and people on low incomes who are getting a raw deal at the moment,” says Mr Day who came to Alice Springs eight years ago as a youth worker. An articulate contributor to the town’s public life – including by pushing for innovative responses to the economic downturn – Mr Day, 38, ran for council in the last by-election. He is married and the father of four children. He is an accomplished skateboarder and a national representative of the sport. He has organised many skateboarding events in the town and recently opened a shop in the CBD selling skating gear and clothing. Mr Day says he has no plans to run for a seat. 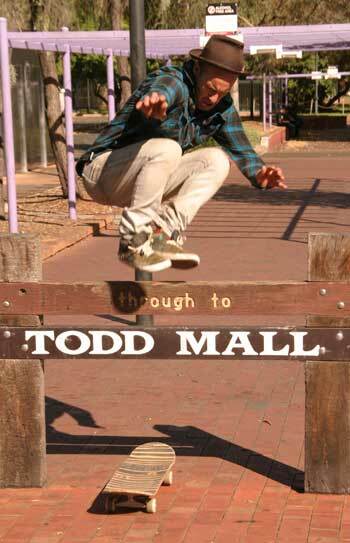 Mr Day is pictured doing a skateboarding trick in the CBD in the days before it was banned. Photo from our archive. I wouldn’t vote for an adult who had skateboarding as a life style. It’s the sort of thing you need to give up by age 15. It is – really. Getting involved in PUP is like re-arranging the deck chairs on the Titanic. You had better make sure that when the captain has had enough of this voyage you are standing next to the lifeboat because heavy wallets don’t float. Interesting that the photo shows the trick being performed “days before it was banned”. I’ve been here 14 years and remember bikes and skateboards always being banned. It was pointed out to me not long after arrived when I got a warning about it from a local policeman. So when was this ban relaxed? And when was it reintroduced? Mr Day has been calling for the reintroduction of ASYAS, the free taxi service taking young troublemakers from one hotspot to the next. I wonder if he has been advocating for these kids to go home, or talking to their parents if they can’t. Having said that though, he is now following due process and taking an active role for change, so for that I wish him well. All we really want are politicians who will stick with their convictions, do no harm and represent the views of their constituents – although sadly, Mr Day seems to be one of many in the respect that he will go wherever the feeding is best! Nice to see his abiding by council bylaws. The “Palmer owned Party” or POP sounds more like a circus every minute. LOL. He’ll write a policy on youth and then skate off back to his little suburban life! Typical.